Yesterday’s experience of Anywhen stays with me overnight. I can’t help thinking that, ultimately, what Phillippe Parreno is doing is playing with our absolute desire for certainty in our lives. I decide to give it another go. 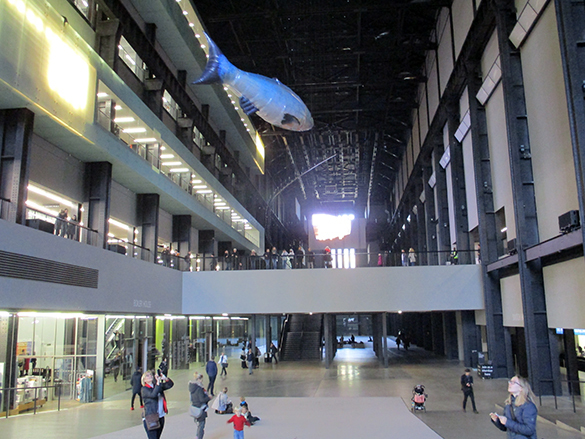 And so, at 11.45 today, I return to the famous Turbine Hall of the Tate Modern. Sombre base non-melodic music greets me. And….. Wow! A helium filled fish drifts by. Children leap in excitement. Adults point their iPhones. I take my place on the carpet. I sit down among a hundred others. Amazingly, most are under twenty years old. 11.50 The music continues; it increases in volume. The lights go up. The suspended screens perform a little vertical shuffle with squeaky mechanical noises. Certainty. It is essential for our mental and social well-being. We look for it in our daily routines, in the sun rising, in religious beliefs and in statistics. The seemingly random happenings in Anywhen deprive us of any certainty in our immediate surroundings. I hear a voice behind from a young lady “I guess it’s all about anticipation!” I guess it is. 11.55 The lights go down again. More music. Some people leave. Others arrive; they wonder why everyone is lying on the carpet. I make a new friend. 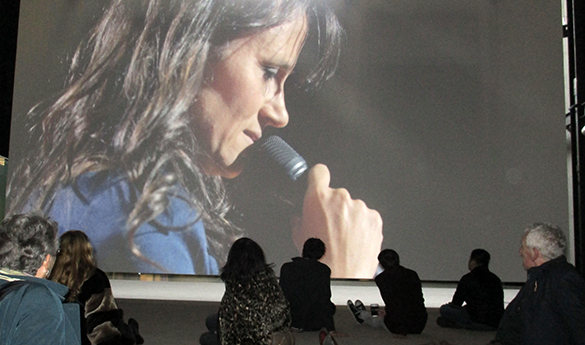 12.04 The ventriloquist lady (Nina Conti) and the cuttlefish-squid are back on the screen. 12.10 She asks “Who is the master? Who is the slave?” My fellow viewers (experiencers?) are drawn into the hypnotic log-curve forms of the fish. 12.25 I look behind. Everyone has a mesmerised expression. A huge chaotic noise rolls down the hall. A hundred school children arrive in hi-viz vests. This, I assume but without certainty, is not part of Perrano’s “immersive” creation. 12.36 The screens descend but only partially. More people drift in expecting the show to begin. I am certain that this is far from certain. I harbour a little smug feeling that I can anticipate their disappointment. 12.38 Right on cue. The lights come on and the screens are hauled back up. Everyone stays. Scratchy recording of folky guitar song. 12.39 Very noisy airplane swoop. Some of us duck in a startled way. Another fish swims by about two metres off the floor. A young girl tries to catch it. 13.01 Only electronic sounds. Nobody seems bored. Some snooze. Some kiss. Some check their snapchats, instagrams and whatsapps. 13.10 Nothing new to report. Feeling hungry. Feeling also rather happy I came back. 13.15 I try to examine my very mixed feelings. I remain intrigued. I am not disappointed. Thanks to the others around me, I am far from bored. 13.20 I conclude that Anywhen is a remarkable experience. It seems the uncertainty that this concept serves up appeals to younger people. Perhaps this is because modern life is so full of … well…. certainties. Who knows for certain? Sorry about yesterday’s blog post, Tate Modern. Bravo, Monsieur Parreno! It is 11.10 on 2 November 2016. 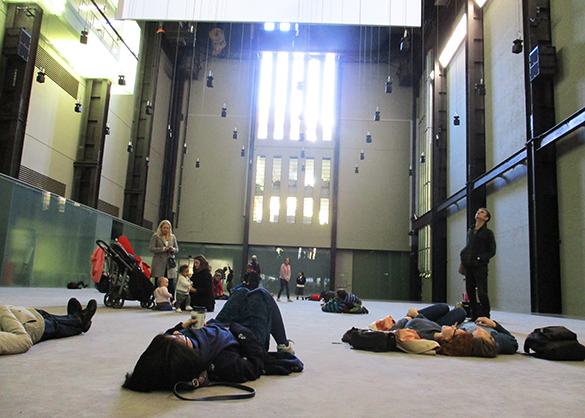 I lie on a carpet in the Turbine Hall of the Tate Modern. (How I love this place!) I am here to experience “Anywhen.” Nothing much is happening. A mother feeds her baby. Some schoolchildren scrap and roll in the enormous space. 11.20 The lights go down. There is the sound of rain falling. Massive white screens hang enticingly from the ceiling. The screens move. Bright white light is projected onto one. There is the sound of waves breaking. 11.25 There is a flicker of excitement from the children. A large plastic fish is spotted moving high among the wires that suspend the screens and multiple loud-speakers. 11.30 I wait. I read the promotional blurb. “Prepare to have your senses activated and stimulated by a spectacular choreography of acoustics, sound lighting, flying objects and film, each connected to the other and playing their part in a far bigger score. 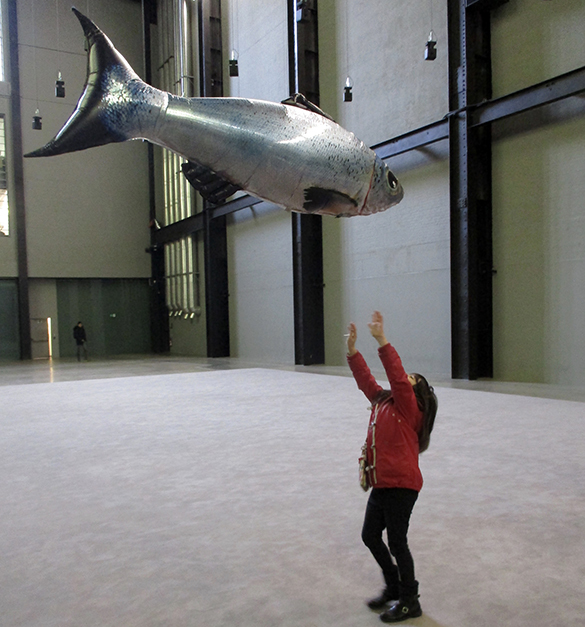 Tate’s Turbine Hall becomes a universe of inter-related and connected events and parallel realities. Events will unfold anywhere.” I am indeed prepared. 11.48. Something is about to happen. There is the sound of machinery. Vehicle reversing warning beeps take over. The screens descend to near-ground level. The hundred or so people waiting with me move with interest. A businessman in very smart pin-stripe suit and tie with poppy plants his brief case next to me and lies down. 11.52. Ah! Something flickers on-screen. A beautiful woman ventriloquist starts to talk into a microphone (without moving her lips!) about perpetuity, eternity, opportunity, complexity, cosmic inevitability and neuronal connectivity. 12.04 Her voice continues in the same vein. On screen is a watery surface. There are splishy. sploshy splashy watery sounds. 12.08 A non-human eye appears. This turns out be the eye of a beautiful cuttlefish-squiddy beast that swims around elegantly. 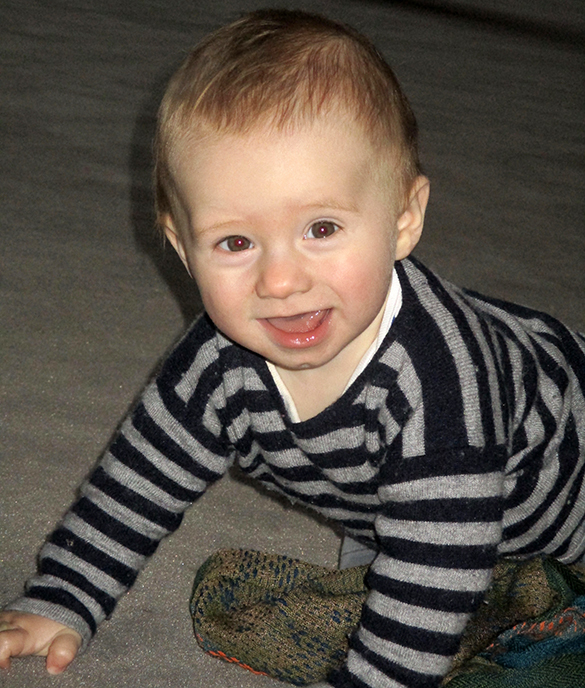 It changes colour in dimply blue-yellow waves. The woman’s voice dies away. The businessman departs shaking his head. 12.10 The lights go up. The lights go down. The speakers crank out a kind of Darth Vader on Ecstasy voice. 12.15 Big lights strobe. The now-fed baby cries in confusion. The screens are still hanging there. The lights go up. 12.22 The lights and screens go up together. The music of a not-so-talented busking guitar player- singer fills the hall. 12.25 His voice is drowned out by what sounds like an underground train passing. 12.26 He stops playing. One person claps. 12.28. The screens descend again noisily. Big machinery sounds. The screens go up. 12.30 I take a photo. I’m not sure why ….. or of what. 12.32 Another fish passes by. A little lower this time. Airplane sounds. Lights flash. 12.40 Just sound. Wait! The screens are moving again.“The Hyundai Commission is a series of site-specific installations by contemporary artists in Tate Modern’s iconic Turbine Halll. It is made possible by a unique long-term partnership between Tate and Hyundai Motor.” I remember the mind-boggling work of Abraham Cruzvillegas. 12.59 I think maybe I am missing something. Caffeine maybe? But I’ll give it another go tomorrow.